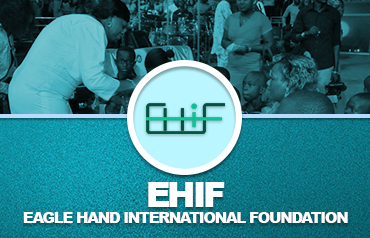 Eagle hand international foundation is a registered non-profit charitable organization in Nigeria. It is dedicated to improving the quality of life of under privileged communities including vulnerable young men and women, under privileged children, also the physically challenged, elderly care for the aged and providing educational opportunities in Niger Delta Region, Nigeria and the world at large. Although registered in September, 2009, Eagle Hand International Foundation has been in operation over the years. It aims to support, engage and empower socially and economically under privileged individuals and communities by improving their living environment, increasing access to health care and education, facilitating social inclusion and creating social opportunities that allow them to build a more sustainable future for themselves. Eagle Hand International Foundation is dedicated to promoting innovative strategic partnership sustainably improve the quality of life of underprivileged individuals and communities through targeted initiatives that provide them the ability to support themselves. Eagle Hand International Foundation also aims to create awareness in the International public about people in need by means of cultural exchange and promote peace in the Niger Delta Region, Nigeria and the world at large. Our vision is to support collaborative initiatives and entrepreneurial partnerships that meet our goals to assist the underserved population, by investing patiently and for the long term, building a people that build the nation, in the Niger Delta Communities, Nigeria and the world at large recognizing that progress is often measured over the long run. In June 2010 the foundation organized a 3-day re-orientation and re-integration for some vulnerable young ladies in warri and its environ, who thereafter wanted to be trained in various fields of skills like fashion designing, hairdressing, computer training, catering, while some wanted to go back to school to adult education to enable them build a more sustainable future for themselves. The Foundation is graduating her first set of skilled acquisition trainees in November, 2011, to enable them the next set of trainees commence their training. Eagle Hand International Foundation in February, 2011,organised a 3-day mind set changing, re-orientation and re-integration program for some ex-militants who have decided and agreed to engage themselves in acquiring skills like Welding, Mechanic, Driving, Aluminum, Fabrication Furniture, Interlocking stones, Plumbing work, e.t.c. that are much more profitable than the carrying of guns and terrorism as means of livelihood. Their program is about to commence. Three out of thirteen of them, are in higher institution of learning. The Eagle Hand International Foundation also runs an orphanage home where orphans from the ages of 0 months are housed, fed, and clothed. These children also go to school right from the kindergarten class. In December every year, Eagle Hand International Foundation, in collaboration with Eagle Flight Micro-Finance Bank, organizes a Poverty Alleviation Program where taxicabs, more than fifty grinding machines and tri-cycles are given to the underprivileged individuals in Warri and its environ to equip, empower and help them make a living for themselves and their families. We are now starting to see our vision for this foundation being materialized and we are truly positive about what has been achieved so far. This has been possible through the support of our friends just like you. Most recently on the 19th of November 2012 to mark Papa Ayo 40th year in ministry and also 25th year of the ministry Word of Life Bible Church some persons that have been trained were given their Starter packs.